It is a well known fact that vegetables are very good for you. They are rich in vitamins, minerals & other compounds that are beneficial to one’s health. Eating them also helps with weight loss. To lose weight, you need to consume fewer calories than you burn. When you do this, your body is forced to utilize its fat stores as a source of energy. Most vegetables contain a lot of water & fiber, which is why they are also very low in calories. This makes them a great food choice when trying to lose weight. In this article, I will list out some of the best vegetables to eat for weight loss. Broccoli is one of the best weight loss vegetables out there. It is low in calories but also has impressive amounts of protein and fiber, both of which help to fill you up. Besides this, broccoli is one of the best vegetable sources of vitamin C, having even more than oranges when compared weight for weight. Preparing broccoli is easy too. All you need to do is steam it for a few minutes, season with some salt and pepper and then enjoy it as a side. Because of their chewy texture, mushrooms are a great replacement for meat. In this study 73 obese adults took part and consumed a diet containing either red meat or mushrooms. After 1 year, the results showed that individuals in the mushroom group were on average consuming 173 fewer calories and 4.5 grams less fat per day. As a result, they lost more weight and achieved lower BMI’s and waist circumferences. Like broccoli, Brussels sprouts contain both protein and dietary fiber (a cooked cup has 4 g of each), which makes them much more filling than other vegetables. Foods that are low in calories but filling are definitely the one’s you want to eat more of. To prepare them, you can lightly sprinkle them with some olive oil and then roast them in a tray that is placed in a preheated oven for 30 to 40 minutes, shaking every 7 minutes or so. The mighty kale, often considered to be the healthiest food on the planet. Available in green and purple varieties, it too is another vegetable that has good amounts of protein and fiber. There is a reason why kale is often praised for being a super-food; if you take a look at its nutrient profile, you will quickly see why. This is one vegetable that you definitely want to eat often, whether you are trying to lose weight or not. Carrots are the best dietary source of vitamin A, providing you with 400% of your daily value per cup. They have the added benefit of being rich in naturally occurring sugars, which gives them a sweet taste. Hummus and carrot sticks are a really good protein & fiber rich snack to have that will keep you satisfied until your next meal. You can make your own hummus at home, chop up a carrot and you’re good to go. Another sweet tasting vegetable is the beet (beetroot to be precise). Be careful when preparing this vegetable, the pigment it contains will stain anything that it touches, including your favourite T-shirt! A cup of beets only has 58 calories and can be used as an ingredient to prepare low sugar weight loss smoothies. Don’t make the mistake of throwing the beet greens away, eat them too. Also known as pak choi, this dark green vegetable is a type of Chinese cabbage that is a big part of Oriental cuisine, but is also being used more and more all over the world. You should be able to find it at your local grocery store or farmers market. Bok choy is a rich source of vitmains A, C & K, calcium, iron, potassium and manganese. You can use it as the base ingredient for stir fries and incorporate it into many low calorie Asian based recipes. By holding a cucumber in your hand, you would never be able to tell that it is made up of more than 90% water. A lot of people tend to mistake thirst for hunger and reach out for food instead of a glass of water; eating plenty of water rich foods can help prevent dehydration. Cucumbers contain powerful antioxidants that fight inflammation and reduce your risk of cancer. Eating them is also a great way to freshen your breath when you don’t have any mints lying around. You didn’t read that wrong, a cup of watercress has only 4 calories! This is because it is made up of 95% water, which has 0 calories. 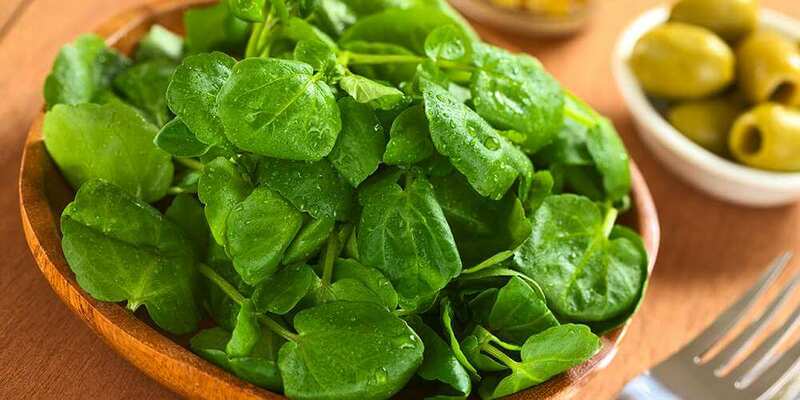 Despite its extremely low caloric value, watercress is fairly nutritious and has some unique disease fighting compounds. You can grow your own watercress at home on a kitchen windowsill so that you have a constant fresh supply to use in salads, soups and smoothies. Both iceberg and romaine lettuce are incredibly low in calories, containing just 8 – 10 calories per cup. Like most leafy greens, romaine lettuce is an excellent source of vitamins A & K, which are needed to maintain the health of your skin, eyes, hair and bones. Lettuce is very popular because lots of large food franchises use it in their sandwiches and burgers. You can make your own low calorie and highly filling sandwich at home using wholegrain bread, lettuce, tomatoes and boiled eggs. Celery has long been claimed to be a negative calorie food, which means that your body uses more energy to digest it than the energy it provides. Unfortunately there is no scientific evidence to support this claim. That being said, celery is fibrous and very low in calories, making it a weight loss friendly food. Celery can also help with digestion and reducing cholesterol levels. A popular protein rich snack that you can have is celery stalks with peanut or almond butter. 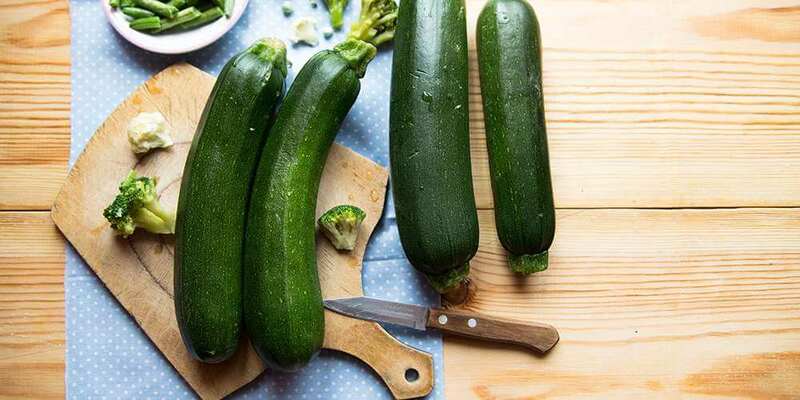 Also known as courgette, zucchini is a summer squash that closely resembles the cucumber in appearance. It provides the body with small amounts of vital nutrients such as zinc, copper and phosphorus. You may have heard of ‘zoodles’. This is a clever play of words and refers to noodles that are made from zucchini. You can make zoodles in your own kitchen and eat them as a low-carb alternative to ordinary pasta. The radish is an edible root vegetable that is native to Europe and a member of the brassica family. There are numerous varieties of radishes available, varying in colour, flavour and size. They have a sharp taste and are often used in recipes to add some crunch. Members of the brassica family contain compounds that have been associated with a reduced risk of a number of different cancers, which is an excellent reason to include radishes in your diet. Endive is a leaf vegetable belonging to the chicory genus, placing it alongside foods such as sugarloaf and radicchio. It comes in two forms, curly endive & escarole, and is high in phytonutrients. Because vegetables like endive are so low in calories, you can eat large amounts without having to worry about going overboard on your daily caloric needs. Swiss chard is a beautiful leafy vegetable with pink, yellow, white and green coloured stems. It is a big part of the Mediterranean diet and is commonly eaten with different types of fish. A simple way to prepare it is to sir fry it with a little bit of ginger, garlic and spices. Swiss chard is one of the best sources of vitamin K that there is, providing you with almost four times your daily requirement per cup. Also know as the spear of the vegetable world, asparagus is often considered a delicacy that is enjoyed on occasion. It contains substances known as saponins that allow it to have antitumour and human immunity enhancing properties. Asparagus is very versatile and can be cooked in a large number of ways. One way is to drizzle it with some olive oil and then grill it in the oven for a few minutes, after which you can serve it as a side dish for a main meal. Bell peppers have vibrant colours and can be green, red, yellow or orange. They all taste great and can be used in a number of exciting recipes. An example is to crack an egg in the middle of a bell pepper and then bake it in the oven. A recent interesting study carried out on mice found that drinking green pepper juice may be helpful in reducing weight gain. Also, red bell peppers contain large amounts of capsaicin, a compound that may assist with fat oxidation. Purslane might be growing in your garden at this very moment. Native to India, it is considered to be a weed by gardeners and often discarded. However this should not be the case because purslane is very nutritious. Studies have shown that it has neuroprotective (brain), hepatoprotective (liver) and anti-tumour effects. So the next time you are doing the gardening and happen to come across it, don’t just kill it and throw it away. Rapini is a green cruciferous vegetable, marketed in the United States as broccoli rabe. You can eat the leaves, stems and buds of the plant. It tastes slightly bitter and is used plentifully in Italian and Portuguese cuisine. Preparing rapini so that it tastes good is considered to be somewhat of an art. Besides vitamins A, C & K which it contains large amounts of, a cupfuls worth provides you with small amounts of lots of nutrients, including iron, manganese, folate and selenium. Radicchio has a lovely purplish-maroon colour with streaks of white and looks similar to cabbage. It has high levels of antioxidant activity, which means that it is able to protect cells in the body from free radical damage. You can use radicchio in the kitchen similar to how you would use other crunchy leafy vegetables. It works very well as the base ingredient in salads. Spinach is one of the most well-known vegetables out there and has been associated with strength and good health for a long time. Indeed, spinach can boost the immune system, enhance muscles, strengthen bones and improve brain function. If you are a fan of smoothies, spinach should be your green vegetable of choice. There are many delicious spinach based weight loss smoothie recipes, some of which you can find here. Another extremely low calorie vegetable is arugula, an edible plant that is commonly known as rocket. Whilst it is nowhere as nutrient dense as some of the vegetables in this list, it does have small amounts of vitamins & minerals. That being said, it does contain a compound called erucin, which a study showed has tumor fighting properties. Arugula’s peppery taste adds a nice flavour to recipes it is used in. Cabbage is a fiber rich food, providing you with 2.2 g per cup. The body cannot digest fiber, so after it is eaten it absorbs water and forms a thick gel that slowly passes through the digestive system. Studies have found that increasing your fiber intake can benefit weight loss. A possible reason is because it helps to fill you up and may reduce your food intake slightly. Including plenty of fiber rich vegetables in your diet helps to increase your overall daily intake. I have to admit, I was never a huge fan of cauliflower, but that is probably because I used to simply eat it steamed and found it very bland and boring. But that doesn’t have to be the case for you because there are lots of interesting recipes that you can use it in. Its white colour seems to suggest that it doesn’t have much to offer in terms of nutrition, but that is not the case. Cauliflower is a rich source of the B vitamins, potassium and vitamin C.
Orange coloured foods are excellent sources of vitamin A, and pumpkin is not different. A cupful provides you with all of your daily requirement of this powerful vitamin that is required for numerous bodily processes. Pumpkin is very handy because it can be used in so many ways. You can use it to prepare gluten-free pumpkin bread, risottos, curries, soups and even some weight loss friendly desserts. This is a vegetable that you may not have heard of; I certainly hadn’t until last year. Also known as German turnip, it is light green in colour and can be eaten raw or cooked. Both the stem and leaves are edible. A member of the brassica family, it has cancer protecting properties, as seen in this study where it was compared with green cabbage. Kohlrabi also has around 5 g of dietary fiber per cup, making it a great weight loss food. Another protein rich vegetable, collard greens have 4 – 5 g of protein per cup when cooked. Increasing your protein intake is a highly effective strategy when trying to lose weight because it boosts metabolism slightly and also reduces calorie intake. Collard greens do have a bitter taste when raw, so it is a good idea to cook them before eating. Mustard greens are another great option and have 15 calories per cup (56 g). Because of its distinct shape, okra is also called ladies fingers and is found in Asian and African cuisine. It can be roasted, pan fried or grilled and used in curries & stir fries. If you have never tried okra before, you definitely should! It does have a bit of a slimy look, but that shouldn’t put you off – it tastes great. Okra has been studied for the benefits that it provides to managing diabetes and its antiadhesive properties for digestive health. As you will see from this list, you are spoilt for choice when it comes to weight loss vegetables. Incorporate as many of these veggies into your diet as you can to reap the many health benefits that they have to offer. I didn’t include potatoes, sweet potatoes and beans in this article because they are slightly higher in calories. That does not mean they should not be eaten when watching your weight. These vegetables are very filling and provided that they are prepared correctly and eaten in moderation, they too can be part of a weight loss diet.